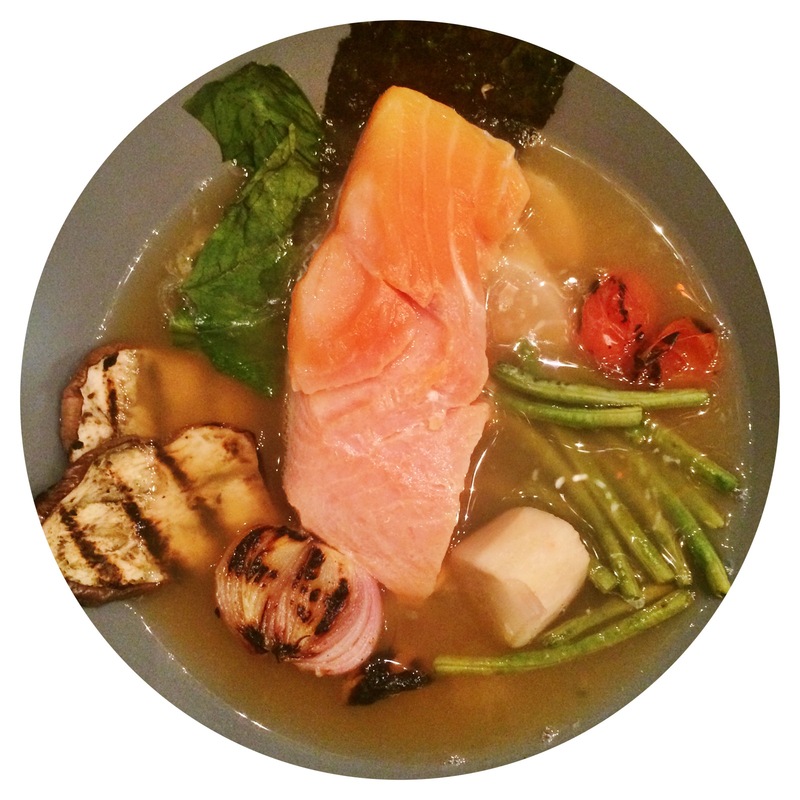 My version of salmon sinigang involves brining the salmon for 45 minutes, cooking it sous vide at 104ºF for 60 minutes, then chilling the cooked, vacuum-packed salmon for a few hours in the refrigerator before serving. It’s a series of prep based on the recipe for Salmon Mi-Cuit at Chefsteps.com. Sure, it’s a more lengthy, seemingly complicated process, but I find that cooking the salmon this way results in incredible taste, texture and color – impossible to achieve when simply steaming, blanching or grilling the fish for sinigang. Thanks to the brining, the salmon retains its bright pink-orange hue, with none of the whitish proteins that usually leach out when the fish is cooked. Because it is slow-cooked, sous vide, at a temperature just a tad warmer than breath, at 104ºF, the salmon comes out “mi-cuit”, a luxurious taste and texture akin to sushi – except it is anything but raw! Finally, chilling the package in the fridge for a few hours (6 recommended) after cooking, allows the salt from the brine to continue “curing” the fish so it yields a dense but fork-tender texture. After that, all it needs to shine is the very hot, very tart sinigang broth. The traditional Filipino sinigang is a one-pot dish. Ingredients – meat (or seafood) plus vegetables such as taro, radish, long beans and spinach – are added to the sour broth in timed progression, depending on how fast each ingredient cooks. Somehow I never get this right – the vegetables invariably turn out limp and overcooked. The broth – tomatoes, onions, souring agent, long chilli or banana pepper, fish sauce, taro (for thickening) – is cooked separately, then – with the chilli discarded – processed in the Vitamix or blender into a smooth, tart and slightly spicy broth. The vegetables (scallions, grape tomatoes, eggplant) are grilled, the char adding a depth of flavour and a touch of sweetness. I could blanch the rest of the vegetables (long beans, radish, spinach), but now I prefer to cook each vegetable in the microwave at 15/30-sec bursts. No mess! And precise. Best of all, the vegetables keep their color, especially the long beans which also stay crunchy. What I love about deconstructing the sinigang is it can be presented at the table with some flourish. Imagine all the vegetables arranged in a circle, the contrast between charred and “blanched” making for visual appeal. A wedge of space is, of course, reserved for the salmon. The broth makes the final and dramatic entrance, poured hot and steaming into the bowl. It releases such an aroma that you know this sinigang is going to be rich and tart. The mouth can’t help but pucker up. 1. Prepare cold or icy water with 2:1 salt to sugar solution. Make sure the salt and sugar are completely dissolved before adding the salmon. Keep in the refrigerator to brine for 45 minutes. 2. Remove salmon from the brine, pat dry and vacuum-pack with oil and cook sous vide at 104ºF for 60 minutes. The oil helps the salmon keep its shape while cooking. 3. Immediately place the sous vide salmon in an ice bath to stop the cooking. Refrigerate 6 hours. For me, this 6-hr refrigeration is optional. I once skipped this step and the salmon still turned out okay. It really depends on how much time I’ve got. 4. Gently remove from the packaging and blot out excess oil. Slice into 4 equal serving sizes, cover and refrigerate until ready to plate. 1. Bring water to boil. Add tomato and onions. Stir in the souring agent (tamarind extract or Sinigang Mix). Add taro. Season generously with fish sauce (you should be able to smell the fish sauce). 2. Add lemon/lime juice. Taste for tartness. Ideally, the broth should register “High” or “Very High” on the sour-meter. Add more lemon/lime juice if needed. 3. Take a piece of taro and test for doneness. When it’s soft but doesn’t break apart when pierced with a knife or fork, ladle out half of the taro and set aside for plating. 3. Turn off heat. Place broth in a blender or use a handheld to blend the broth, making sure the taro is broken down and there are no lumps in the broth. If the broth is still watery, add more cooked taro and blend to thicken. The consistency of a light creamy soup is what we’re going for. It may happen that there will be no cooked taro left for plating, but that’s ok.
1. Heat cast-iron grill until almost smoking. Grill tomatoes and shallots (cut side down) until slightly charred. 2. Place long beans in a small bowl and cover with plastic wrap. Microwave at full heat for 30 secs or until cooked but still crunchy. Repeat with the radish and spinach. I prefer the radish al dente and the spinach just wilted, so maybe microwaved at 40-45 secs and 15-20 secs, respectively. Divide and arrange vegetables and salmon in 4 soup bowls. Bring to the table and add broth, to serve. • My most recent sinigang experiment (above photo) includes nori. Since the salmon was skinned, I figured nori sheets would approximate the taste and texture of salmon skin. Interesting, but it didn’t add much. Next time I’d take the skin peeled from the salmon and bake/toast it to a crisp – much like chicharron or pork rinds. A topping like this should add another, much needed, texture to the dish. • Mi-cuit means half-cooked, in French. • Chefsteps.com is a website on contemporary cooking founded and led by Chris Young, the co-author of the acclaimed six-volume cooking opus, Modernist Cuisine: The Art and Science of Cooking. Check it out!